Now that everyone is on new Gmail, access to contacts for Shared or Delegated Mailboxes is different. Learn more. Starting today, New Google Contacts is available for you to try. January 15th, everyone will be moved to new Contacts, but you can switch back to old Contacts temporarily. Beginning February 12th, everyone will be on new Contacts, and old Contacts will no longer be available. To New Contacts now, sign into your Stony Brook Google Account at contacts.google.com, and click Try Contacts preview in the bottom-left corner. Between now and February 12th, switch back to old Contacts by clicking Switch to old version in the bottom-left corner of new Contacts. You can use your contacts to store names, email adresses, phone numbers, addresses, employer, department, or job title. 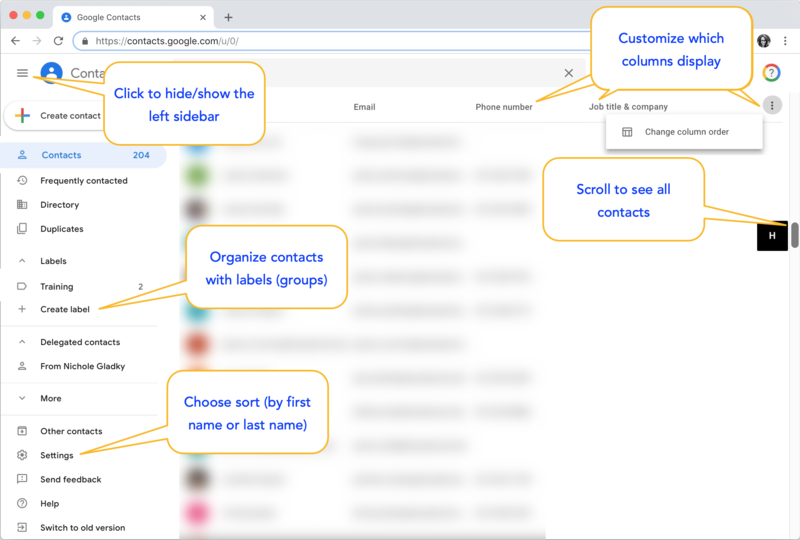 Google Contacts will work with your other Google apps (such as Google Mail and Google Hangouts), so that you can easily access your information when you need it. Sign in with your @stonybrook.edu email address and your NetID password at google.com/contacts. Access Google Contacts from other Google apps by clicking on the grid icon in the top right corner. From Contacts, click + Create contact near the top left; then fill out information for that contact. Learn more about creating, editing, and removing contacts. Google Contacts syncs with your other Google applications and suggests contacts. For example, when you start typing in the "To" field in an email, a list of suggested email addresses from Google Contacts will appear. How do I use a Shared or Delegated Mailbox's Google Contacts in New Gmail? Can I delegate contacts to someone else? How do I create a personal contact group (label)? Are there any other tools to consider instead? How do I specify which email address to use in a group/label in new Contacts? I do not want my individual office telephone number listed in Stony Brook's Google Apps for Education Directory. How can I change this? What information is available in Contacts? Does it include my contacts and the Stony Brook Directory? How do I delete a contact from autocomplete? How do I make sure I am sending an email to the correct person when the person's name shows up multiple times in Stony Brook's Google Apps Directory because it is a common name? How do I export my Google Contacts to another Google account or contact manager? How do I import my personal Google Contacts to my Stony Brook Google account?